Last autumn, sitting around talking about organisations we’d like to work with, we got excited about the MND Association. We could see an opportunity. The Ice Bucket Challenge had had its day, but how many people made the connection with motor neurone disease and knew where their money had gone? We made a few approaches through the tail end of last year and were delighted to receive a call in February from the MND Association comms team, saying that one of the three agencies they had invited to pitch for the 2015 awareness campaign had pulled out and would we like to travel to Northampton a week later and take their slot. 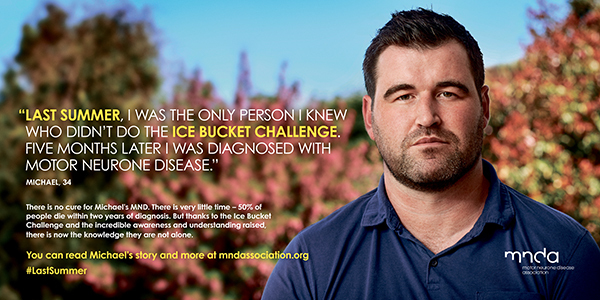 They were keen to explore the same opportunity and find a creative way to connect the Ice Bucket Challenge with MND, the MND Association and the unprecedented £7m in donations. Clearly everyone was over the Ice Bucket Challenge. We needed to find a way of putting it back into the public domain without it feeling like it was being resurrected and being mindful of public fatigue. But we were also clear this was a one-off chance for MND Association to raise awareness of the condition and raise the profile of the organisation fighting to improve lives for those dealing with it. The few days of pitch preparation were energetic and creative – we were in our flow and produced some great concepts. The #LastSummer campaign idea was a response to the shocking statistic that half of people with MND die within two years of diagnosis. And so, since last summer, mothers, brothers, wives had lost their fight with MND and were no longer here. 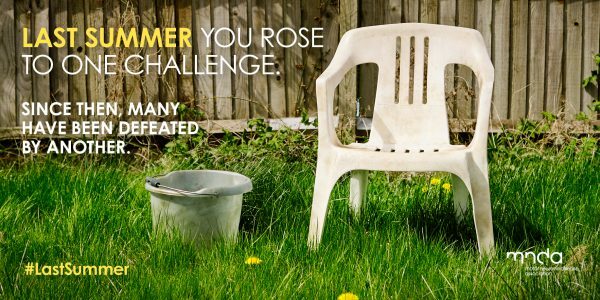 The headline – “Last summer you rose to one challenge – since then many have been defeated by another” – felt strong and we were excited about pitching. The idea resonated with the team at the MND Association, and we were over the moon to be selected to work on the campaign. We spent the next two months working flat out creating the supporting material including stories from Ailsa Malcolm-Hutton and Michael Smith, hugely inspiring people living with MND, and a short film to be shown online and in cinemas across the country for the month of June. It was pressured and fast paced and everything you’d expect preparing to launch a month-long awareness campaign. We all really believed in the #LastSummer concept and were launching with the hope that the whole campaign would be received well and make the most of that opportunity we had all identified. By 11am on the first day of the campaign we were all feeling very differently. Michael’s story is poignant. He didn’t do the Ice Bucket Challenge last summer because he was marrying his partner Tracy. Five months later he was diagnosed with MND. But our campaign poster featuring Michael was interpreted by some as suggesting that if you didn’t do the Ice Bucket Challenge you’d develop motor neurone disease – a sentiment quickly shared and amplified on Twitter. A really tough few days followed. For Michael and his family, for our friends at MND Association who had all worked tirelessly to launch the campaign, and for us. There’s no doubt that the headline copy for Michael’s story could have been better. Once you see that it’s open to that interpretation then, absolutely, it’s right there. But we didn’t – none of us did and over 100 different people looked at that advert in the run-up to launch. 1) It’s been really helpful for us to remember our intention. We worked with integrity throughout the project. And coming back to that allowed us to be stronger together during those difficult days. The practices we have been putting in place over the last couple of years, for how we work with each other and with our clients, enabled us to respond to this better then we might have done in the past. No blame, no judgment, consciously choosing to hold a more positive perspective – I’m not saying we breezed through, but we had a resilience and a way of talking about what was happening that comes directly from our ongoing commitment to making the way we work as important as what we work on. It certainly helped that the MND Association handled everything so professionally, reaching out to Michael and keeping a very balanced and steady view as things unfolded. More formal testing might have drawn our attention to this interpretation of the headline for Michael’s poster. We’d been most focused on getting the copy right for the ‘lead’ chair and bucket creative. We’ll certainly think more about where testing is helpful with supporting campaign creative. We do need to think more about each element of a campaign being seen in complete isolation. It’s easy to look at the campaign as a whole and see it in terms of lead creative and supporting materials. That’s not necessarily the way a campaign is experienced, and every individual element needs to work in its own right and tell the correct story. 6) Does fundraising vs awareness mean much? I’m just not sure that the general public make any distinction between a charity fundraising campaign and an awareness campaign. For us it often seems fundamental. It’s one of the first questions we ask clients during any campaign briefing and I think we all (agencies & charities) take a different approach with fundraising campaigns versus brand or awareness campaigns. Many charities will have separate agencies appointed to work on each type of activity. Obviously the groundswell of cynicism is a result of the public being fed up with being made to feel bad and then give money. Perhaps all charity campaigns are being viewed through this lens now. This MND Association campaign was for awareness month, and featured no fundraising ask at all. So we felt able to be bolder. The interpretation of Michael’s story as ‘bad karma’ tapped in to that vein of cynicism and fatigue. I’m keen to understand this better, and whether any distinction between these types of campaigning is relevant for a broad public audience. I remember hearing Michael’s story for the first time and having goose bumps. He’s a strong young man who is now facing a horrible disease and he wanted to tell his story as part of this campaign. We still feel proud of the overall #lastsummer campaign concept and the creative executions in cinema and outdoor. We all wish we had seen the potential for the interpretation of Michael’s headline copy and made the experience of sharing his story more positive. We are, as ever, grateful for the opportunity to learn and grow together as a team and with our incredible clients and partners. The work we do together matters, and we will keep doing our very best. What are we learning about why content travels online?